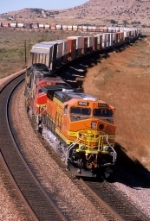 Description: BNSF Westbound Intermodal Train at Cosnino, Az. Description: BNSF 4842 leads 4 additional units as it rolls through Old Monroe, Mo. Description: Empty Bow (New Hampsire) coal train with a seldom seen BNSF on the point. Description: On the main passing Barr yard on a rainy day! Description: 213 heads west under the Derry Road signal bridge at 2:43PM with a BNSF Dash 9 trailing. Description: North Yucca Ave., 1703 hours.